Out surfing the other day with SacRiverRat & Jklein and the wake seemed a bit steep. Troy, pipe in here and tell everyone what kinda weight we had going...Thanks. How do you get a little less steep, a little more ramp? More weight in the bow? Thanks for the help that is bound to show up. Add weight in the bow will lengthen the sweet spot. You know what just occurred to me is the first time in I had no problem staying in the sweet spot and riding ropeless. The second time I couldn't seem to find "the spot". The only difference, the first time we were going basically straight, the second time we were doing the "big circle" thing. I've surfed ropeless behind an unweighted Maristar before not doing the circle thing so I gotta think that had something to do with it. A slight arc to the side that you have your weight/rider will clean up the wave and give it a nice curl. Shouldn't take much of a turn at all and it depends on the boat. You'll just have to play with it a little. You should still add some weight to the bow to lenthen the wave. Michael I'll have to make it out with you guys next time so that I can hang my fat a** over the side. As you may know Troy came out with me on Sat to bullards. Well we had two people on the left. One sitting on the deck me hanging off the tower and troy driveing from the passager side. But I think we needed more people to get a sweet long wake. It was ok but stull could have been longer and higher. stewart - we have a parasail seat that we hang on the side of the tower. Put a good sized boy (or 2 girls) in it and they hang off the side of the boat. There's a pic of Ken (RiverRunner) in it around somewhere. Makes the boat list to that side and gives a real nice curl to the top of the wake. Also a great vantage point for pics. Got pulled over 2 weekends ago while I was out on it but all he was concerned about was jackets - sez the slings OK as far as he knows. 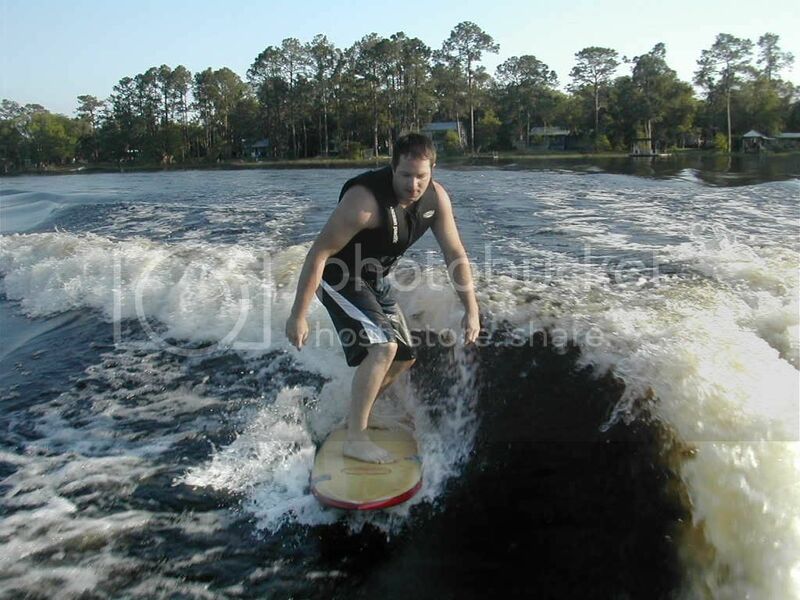 When wake surfed for the first time this Saturday with out the rope. It was fun, we used an old surf board I had. Here is a pic of a friend of mine. Notice the duct tape on the board. Let's see if you and Michael were in the boat, I would blame the rider for sure... must have been the rider.